Jabber itself has been working just great, and as it is a federated network we’ve been able to talk with people on multiple IM providers. Gmail’s Google Talk integration has proven to be a convenient way to chat when at a client’s computer. However, I haven’t been entirely happy with the client itself. While looking for better alternatives I decided to test Adium, the native Mac instant messaging application built on top of GAIM’s multi-protocol libraries. 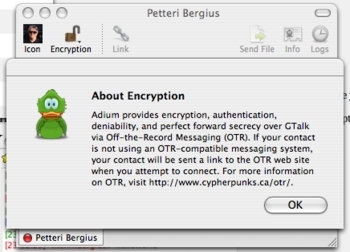 Adium uses Off-the-Record encryption for securing the conversations. OTR has several advantages over GPG for IM purposes and supports several clients including Adium, GAIM and Trillian. We’ll have to see how well OTR works over some weeks of testing. Other nice things about Adium include Plazes integration, Growl notifications and support for the Gizmo VoIP network. We haven’t yet made decisions about Gizmo vs. Skype. While Skype has a much larger user base, Gizmo follows open standards and so would fit better into our open source strategy. Zfone security and the possible upcoming Nokia 770 integration would also be big bonuses. For quite a while we have been using IRC for instant messaging and company internal chat. IRC is handy for it, especially as we’ve been able to set up some bots to secure our own channels. 26 February 2009. 1 minute read.